This episode is about the Angel Eye Team: Gong Hyung-jin, Seungri, Gu Hye-sun, Lee Sang-Yoon, Kwon Hae-hyo, Kang Haneul, and Kim Ji-suk completing Running Man as a team. Sang Yoon and Kwang Soo were co-stars in Goddess For Fire, Jungyi. Yoo Jae Suk remarked that Kwang Soo is the dumb prince. Haha. They also tease Ji Suk clumsy variety image. Their prize for the day will be the money in the envelope from SBS Variety and Drama department. Both teams will compete with each other for the best rescuers. First of all, both teams will be test on their teamwork. They have to climb up the 63 floors building in a royal relay race. Both team begin to strategize right away. Haha urgued that Jong Koo should at least climb 20 floors, while Kwang Soo stated that Jong Kook can climb the entire building. Sure enough, Jong Kook is going to climb up almost 20 flight of stairs. Everyone get ready to face their opponents. The Running Man are in good shape especially Haha and Ji Hyo. They overtake their opponents very fast. Finally, it was down to Jong Kook and Hye Sun. Being a gentleman, Jong Kook keep smiling when Hye Sun distracted him. In the end, Jong Kook apologize to Hye Sun before grabbing the flag. The PDs revealed the real mission and that is for them to find the words written below the pictures while they were climbing up the stairs. Each team were given walkie-talkies and they need to find the painting. Jong Kook told his team members to look for the word under the tiger but nobody was paying attention to Jong Kook. Ji Hyo finally caught what Jong Kook say and search for the painting. Seungri and Hanuel were looking at the same painting and Ji Hyo took down the two guys in a chaos. Jong Kook eventually got the answer right but he was a step later than Hye Sun. In fact, Hye Sun went to a quiet area to listen attentively to the answer while Jong Kook went down the stairs. The next mission is a quiz game and if they give a wrong answer, the team members will be blast with dry ice. Hae Hyo did well and eliminated Gary and Jae Suk. I learnt that 2018 World Cup will be held in Russia. Ji Hyo and Hye Sun challenge each other but none of them knows the answer to the question. Suddenly, Seungri fall from the chair, giving us the first physical gag of the day. Haha picked the entertainment topic and he almost got it right. Jong Kook was asked to pick a topic about medical since his brother is a doctor. He answered the question correctly but was eliminated by Sang Yoon. Now, the Angel Eye team is on the lead. The Running Man team proposed another match to determine the winner. In exchange for a chance, Jong Kook have to kneel down on the floor which he does for his team. Kwang Soo and Ji Suk were picked for the challenge. 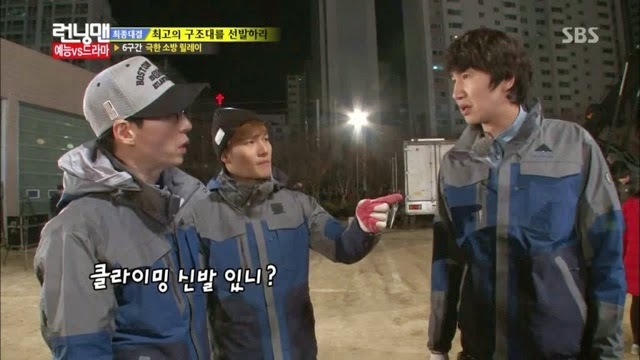 Ji Suk revealed that he is a certified teacher and Jong Kook warn Kwang Soo that he may end up crawling home if he don't get the answer right. Before they hear the entire question, both start to call out foods such as fried eggs and potatoes. Eventually, Ji Suk got the right answer after Kwang Soo failed to give the correct answer. After the Running man members literally eating up the mission card, they wondered what is the next mission. Sang Yoon talked about his experience with the Acupuncture mat during the car ride. Who knows their next mission also have something to do with this Acupuncture mat. Their mission is to push each other off the mat. The Angel Eye team started to attack the Running Man team. They caught Jae Suk while the rest of the Running Man members look on as their leader was dragged and pushed down the mat. Gary was full of confidence because Tiger Jong kook was supporting him at the back. 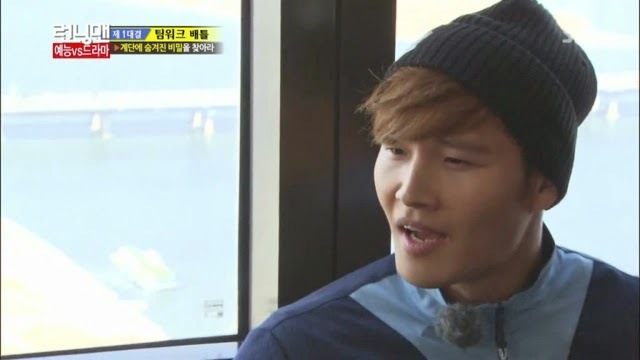 During the chaos, Jong kook saw the opportunity and attacked four rival opponents. Kwang Soo and Hae Hyo did a one to one challenge and the latter wins. Spartakook have to challenge the action star Hae Hyo who apparently is a tough rival. However, Spartakook still managed to push him down. In the end, Spartace gently push Hye Sun down and emerge as the winner team for this round. Their last mission is to be the fastest rescuer team. The winners for every round have an advantage over the other team in term of choosing between two options. The Running Man team related that the previous Han River race winners actually started off last. Kwang Soo was given the task to do rock climbing but he does not have the proper footwear. Both Jong kook and Jae Suk gave him a lecture. Jae Suk finished off by asking him to go shop for a pair of climbing shoes next time. All of them were practicing their own mission. Ji Hyo was impressive when he slide down the fireman pole with Seungri. She pasted the nametag on Gary before jumping up his back. Gary have to carry her while he does the fire walking. Next, Jae Suk have to use a gourd to put out the fire while Hye Sun used a fire extinguisher. After that, Jong Kook and Sang Yoon have to climb over the wall. However, Sang Yoon was struggling since he had exhausted all his energy during practice. Ji Suk and Hae Hyo had problems holding the hose as it spray the water like a fireworks. After some time, they managed to put out the fire. Finally, Kwang Soo started to do rock climbing. Hanuel had an advantage since he did rock climbing for a year and a half. Soon, he catches up to Kwang Soo. Now, they were neck to neck in this competition. Kwang Soo mustered up his courage and rang the bell. Running Man won the race and received the two envelopes as rewards. It has been a long time since the Running Man work together as a team. Indeed, they are the best if they were united as one. I love their interaction and their close 'family' relationship. Their first mission failed because they were talkative, however I did suspect that they give in to the guest team. Anyway, Running Man members are in good shape because of the training all these years. Spartakook is finally back in action after So Long and I appreciate his effort to help his teammates. Each Running Man members have a theme song or sound effect. I love to see Spartakook in action! We all know that his weakness is Women. I am glad that he grab the flag, instead of giving in to Hye Sun. Spartace is a really strong team and it shows in this episode how well they work with each other. Kwang Soo is pretty impressive during these few episodes. I wonder if the PDs and production team did read the comments posted by the fans. It is good that Kwang Soo had improved so much in his variety sense. I hope he will continue to keep up his good work. The rest of the Running man members did not disappoint and put in efforts to win the race. The Angel Eyes team is a better team than the Jungle team in my opinion. They processed sportsmanship and is fun loving. Just like many other fans, I felt that this is a great episode with a good mixture of interaction and fun games.